Super Bowl week to start with snow. The National Weather Service has issued a Winter Storm Watch from 4 AM to 10 PM Tuesday morning for all of North Georgia stretching down to the Metro Atlanta area. Meteorologists are predicting up to 2” of snow for the affected area. 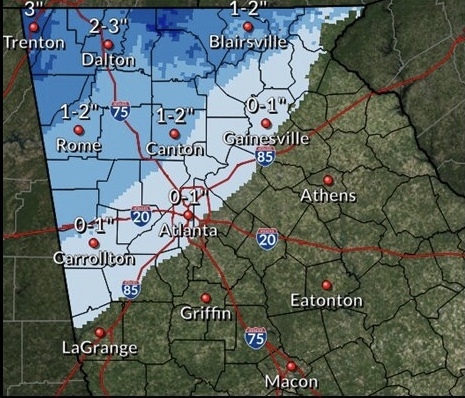 Higher elevations in North Georgia might see even more snow. Meteorologists are forecasting a strong cold front combined with precipitation that could lead to snow. The temperatures are expected to drop well below freezing. So officials warn that black ice is also a possibility, even if snow doesn’t fall in your area. We all know how bad traffic can get in Georgia on the regular, but snow is another monster. Take into account that the Super Bowl is in town this week, and you can imagine the amount of traffic you might face when traveling downtown. So, it should go without saying, be cautious when driving these next few days.